A week and a half ago, specifically Sunday June 19th, we noticed that there was something wrong with Rerun. For those of you who know Rerun that’s a pretty general statement. He’s a weird little dog. Specifically, this time he had a foot problem. He’d apparently managed to impale a toe or get bitten or something. Either way, it wasn’t pretty. His second toe on his front left foot was approximately three times the size it should have been and he had licked/nibbled on it to the point that hair was missing. Knowing Rerun’s temper, we muzzled him, wrapped him in a blanket, and functionally hog tied him to keep from hurting himself. He thrashed, growled, probably swore, and tried, despite the muzzle, to eat whatever human body part got closest to him. Despite all of this we managed to bathe his paw in hydrogen peroxide, clean it, and drain the infection out of it. Because it looked like, at minimum, an allergic infection, we gave him a weight appropriate dose of Benadryl and decided to call the vet first thing in the morning. We called when they opened and they had an opening at 11:15am. By the time we got there is was clear that he was feeling a little better, but his toe was still quite swollen. The vet, one of the newer members of the practice took a look, inspected all of his feet, and upon finding out from us that he was a self nail trimming dog, opined that it was most likely that he’d split his nail to the quick while chewing on it and that’s how the infection had gotten in. When she showed me that there was, um, infected fluid, coming out from under his nail, it made total sense. We came home with a scrip for pain meds, 3 weeks of antibiotics, and the Cone of Shame. 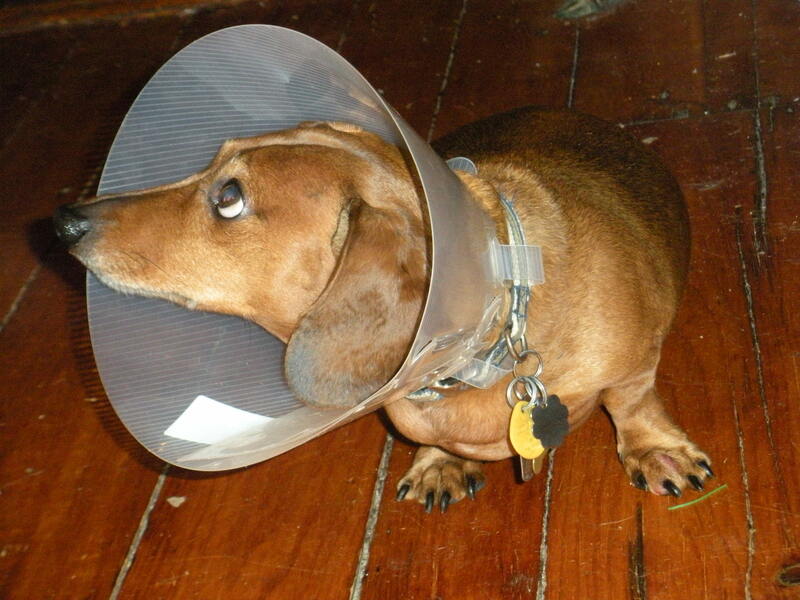 That’s right, Rerun got an e-collar. This immediately turned him into a Zombie Dog. He came in the door and refused to move. He just lay down wherever was most inconvenient and remained there like a rock. A rock with Sad Puppy Eyes. Naturally this required pictures. For posterity, of course. "Daddy, please take this off. Please???" "Take another picture and I eat your face." If you look closely in the photos you can see the swollen toe on his front left foot. 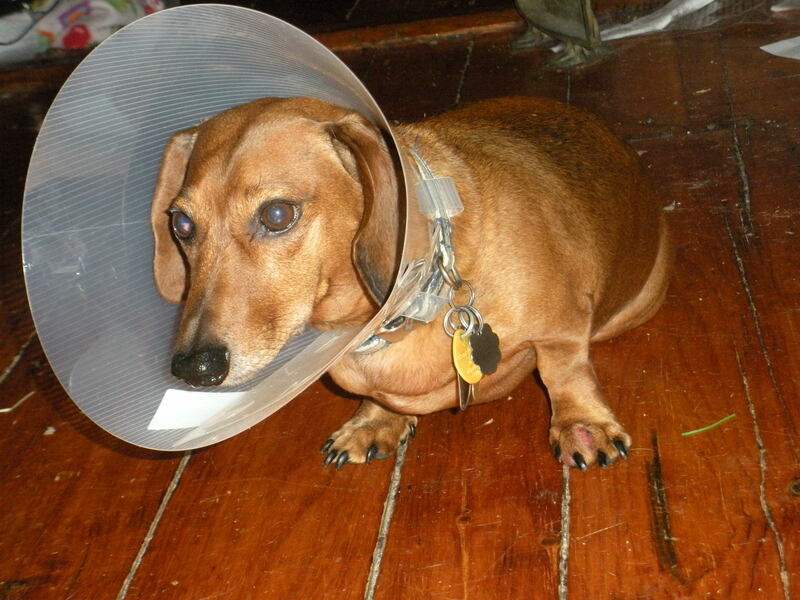 It looks MUCH better now and he’s clearly feeling better, though he still HATES the e-collar. If I can get any more photos without inducing him to kill me in my sleep, I will.